Forget What Did: Don't you hate it when you buy a nice bunch of tulips, and then one of them turns rogue? Don't you hate it when you buy a nice bunch of tulips, and then one of them turns rogue? The question now springing, Zebedee-like, to mind is, "How's the writing going today, John?" How dare you. 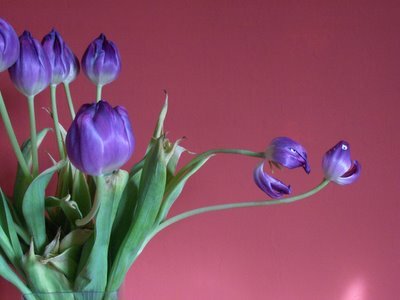 I defy anyone, once having noticed that of their tulips appears to be chasing another one, NOT to spend 25 minutes making them little paper eyes, and taking pictures of the result. It's a basic human drive, like thirst. It has nothing to do with any deadline I may or may not have looming over me that absolutely cannot be missed, or else. Similarly, it is merely a pleasant and diverting hobby to play 30 consecutive games of hearts against my computer. I can think of no better use of my time. Necessity is the mother of invention. Boyo. Es is nicht groB und es is nicht gescheit.